When most uniform companies say that they make "Custom Lab Coats", what they mean is that you can get a mass produced lab coat with your name and logo embroidered on it. Crooked Brook is a unit of the atelier division of an art studio that offers full service apparel design, pattern making, sample making, private-label small lot production, direct to garment printing and embroidery. In addition we offer custom designer lab coats and colored lab coats made according to a customer’s fabric and style specifications. By combining the different options; (fabric, buttons, pocket, collar, cuffs, sleeves and piping) you can design your own lab coat, or you may order a lab coat the way it appears here on our website. In some cases, we make lab coats from customer supplied fabric, closures and an their own individual pattern. 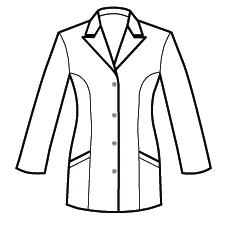 Women's lab coats are available in numerical sizes 2-26. For women whose size is considered petite or plus size (extra large or over size 20), we recommend that you call us to discuss your body measurements to ensure a proper fit. Knowing that very few women's body measurements correlate with the garment specifications of a given size, we offer women's lab coats in what we call combination sizes. For example, if a woman's body measurements were 39-31-41 according to our size chart she would be our size 14. However, if her measurements were 39-33-43, she could order a combination size 14 top, 16 bottom women's lab coat. 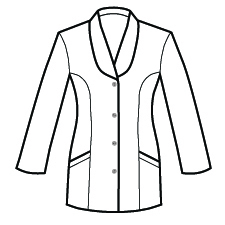 By using combination sizes, maternity lab coats can be made in any of our women's lab coat styles. 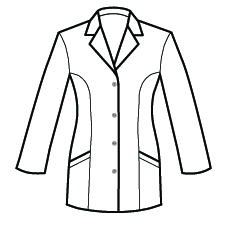 Laboratory coats. Typically not a subject that garners much public attention. However, the origins of the garb that has become symbolic of all-things-science is worthy of contemplation. When compared to the history of clothing, the lab coat is a relatively recent invention. Great scientific minds of the 16th century, such as Galileo Galilei and Johannes Kepler for example, never donned such a garment. Rather, plain robes tied with cords were preferred. Even into the 18th century scientists either used robes or the dress of the elite: powdered wigs, cutaway jackets, and black silk stockings. It wasn’t until the 19th century that scientists began to wear a version of the lab coat we know today. The word coat is one of the earliest clothing category words in the English language, traceable back to the Middle Ages. An early use of the word can be found in the phrase “coat of mail,” a loose, shirt-like garment of metal rings, usually extending from the neck to the knees with sleeves to the elbows. In medieval and renaissance times, the coat became a mid-length, sleeved men's outer garment, fitted to the waist and buttoned up the front, with a full skirt not unlike the modern coat. By the 18th century, coats had begun to take the place of customary capes and cloaks as outer wear, and by the 20th century the term jacket became interchangeable with coat for short garments. By the early 19th century, science had damaged the respectability of medicine by demonstrating that its cures were worthless, relegating much of medicine to the realm of quackery. While scientists were admired, physicians were distrusted. As scientists engaged in early microbiology and biomedical research, they protected their clothing with dark coats, which readily identified contaminates. Physicians, looking to science to regain credibility, began to don dark coats, as well. It was common throughout the 1800s for hospital staff to wear dark clothing to show respect for the dead. Even into the early 1900s medical students wore black lab coats while dissecting cadavers out of respect for the deceased. With significant medical breakthroughs made by chemist Louis Pasteur, surgeon Joseph Lister and others, the perception of medicine changed forever. With germ theory and the introduction of sterile medical procedures, purity became a focal point. Ideas about sanitation in all areas of medicine changed and, as such, the color white became a symbol of cleanliness. As medical practices improved, so did the physician’s appearance. Coats were made from white cloth, a move deemed especially important as the darkness of previous garb conveyed too much a sense of pending death and mourning. 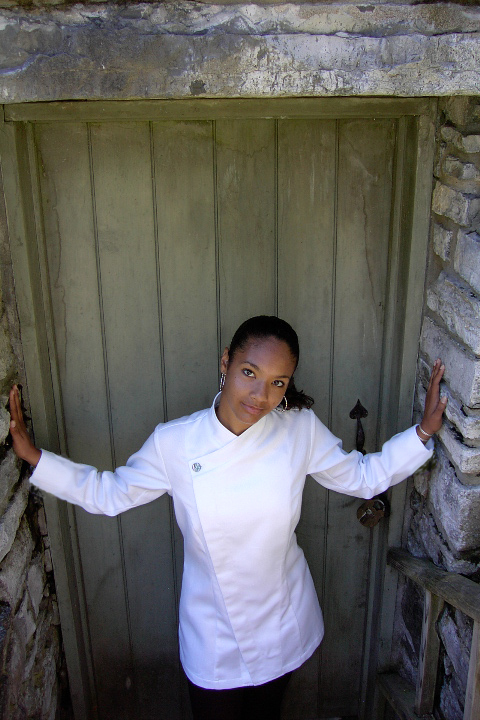 The white coat helped convey to the populace medicine’s new sense of purity, healing and hope. 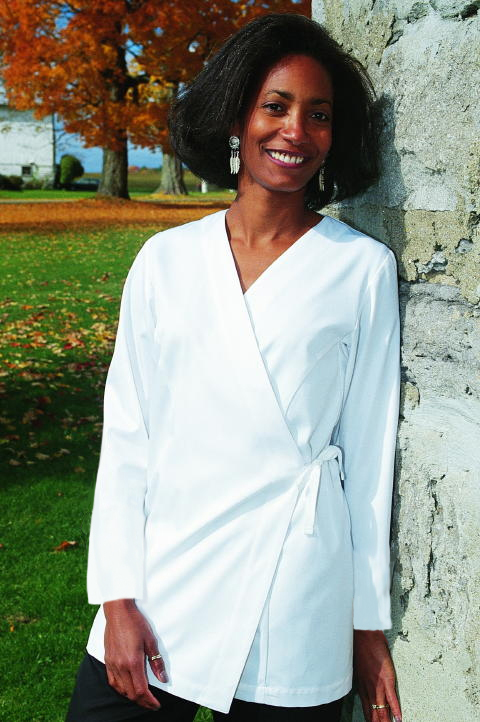 Medical advances served to boost the status of practitioners from quacks to purveyors of knowledge and healing and the white lab coat became a representation of that shift. As medicine became more scientific and scientists moved into hospitals, scientists also took to wearing the same white coats as doctors. This was done partly for efficiency and partly to give scientists added status in the medical community. Today, the white lab coat has become engrained in the psyche of the western world, as much a symbol of medicine as the serpent and the staff. The perception is that the wearer is somehow different, special. Though it is still a physical shield guarding against spills, it is also a symbol that separates the wearer from the everyday and places him or her amidst society’s elite. Many physicians are choosing to skip lab coats these days thanks to studies suggesting they make patients nervous. One identified condition called “white coat hypertension” is a phenomenon in which patients experience elevated blood pressure when in a clinical setting or surrounded by those wearing the garb. Although some in the medical community are opting for scrubs, lab coats are still favored by many, from dentists to chemists to engineers. And thanks to the influence of fashion and innovation, the coats can be found in as many styles and colors as there are professionals that wear them. So the next time you see a multi-colored lab coat pass you by, don’t be surprised. It may just be a scientist with an urge toward individuality. From heavy robes to fashion statements; after 100-plus years maybe it’s about time.